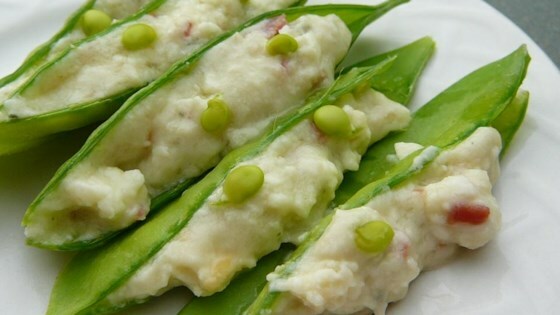 "For the perfect appetizer for baby showers, garnish each one of these cream-stuffed goodies with a bit of cream cheese and one, two or even more individual peas, depending on how many she's expectin'! Or if you prefer, garnish with cooked baby shrimp." Remove string from pods and trim off the blossom end. Make a small slit on flat side of pod. Soak pods in ice water for about 1 1/2 hours. Drain and dry pods. Put cream cheese in a pastry bag and pipe enough cheese into pods until full. Arrange pods on a platter lined with spinach or lettuce. Garnish each pod with a bit of cream cheese studded with the appropriate number of peas, depending on how many the mother-to-be is expecting. I made these years ago. They are delicious and fun to make. Always a big hit. I had to make double what I needed because I ate about every other one. good and easy but they do take time. Really good. I made my own herb cream cheese and I did blanch and shock the little peas that I used for a garnish. These were so cute on the plate not to mention very tasty.